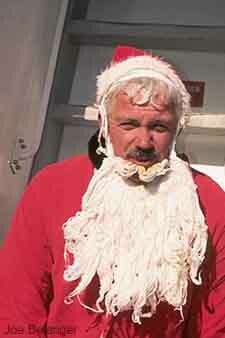 Every Christmas season, one of us volunteers to be a scuba Santa. Santa takes down gifts hands them out to us divers who were good during the year. We love to visit the Burrito Factory after a day of diving. Some of the group gets a little crazy after a #36. This is one of our diving beginners, who relies on her teddy for advice. 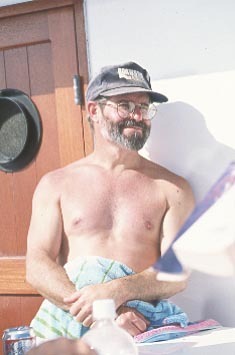 Here, Dr. Storm relaxes in the hot sun during the ride back to port. Some divers prefer to read a good book after a long day of diving. 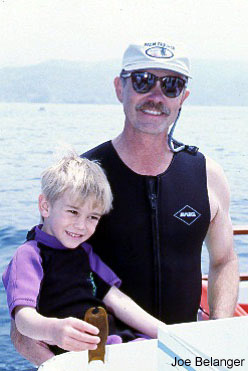 Some divers start off young by being introduced to various marine life. Here, my buddy shows his son a shark egg. 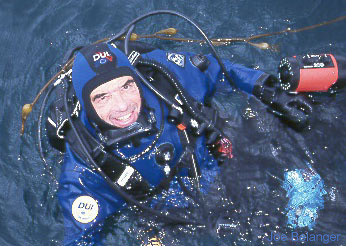 Some divers prefer to dive dry. It's just not a good idea for immersion dialysis (peeing in your wetsuit) to take place while underwater. 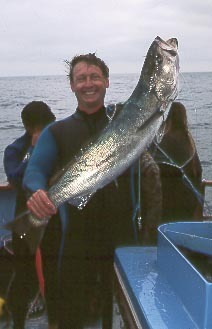 Jim poses with his catch of the day: a white seabass. 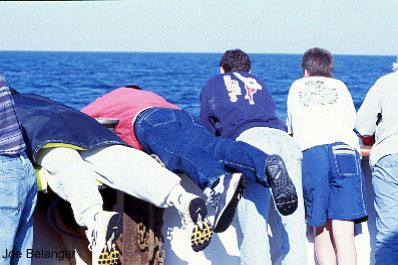 During channel crossings, passengers are often treated to awesome dolphin shows. The dolphin swim the boat's bow and you can get a close up look at them. Here, some divers darn near fall overboard just to get a good look. 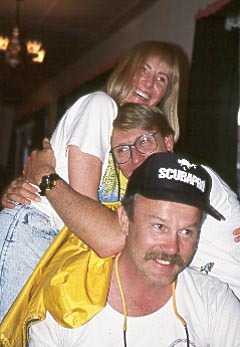 Photo gear is a popular intra-hobby among scuba divers. 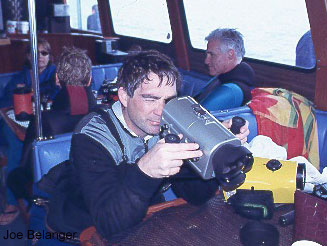 Here a videographer tests his housing before the next dive. 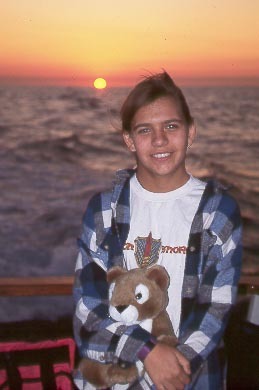 Please come back soon... we are always in the process of having slides scanned for this page. Thank you for your interest and I hope you visit again soon.